Incision CVDs for your Axial RR10 Bomber/Wraith/Deadbolt/SCX10 « Big Squid RC – RC Car and Truck News, Reviews, Videos, and More! 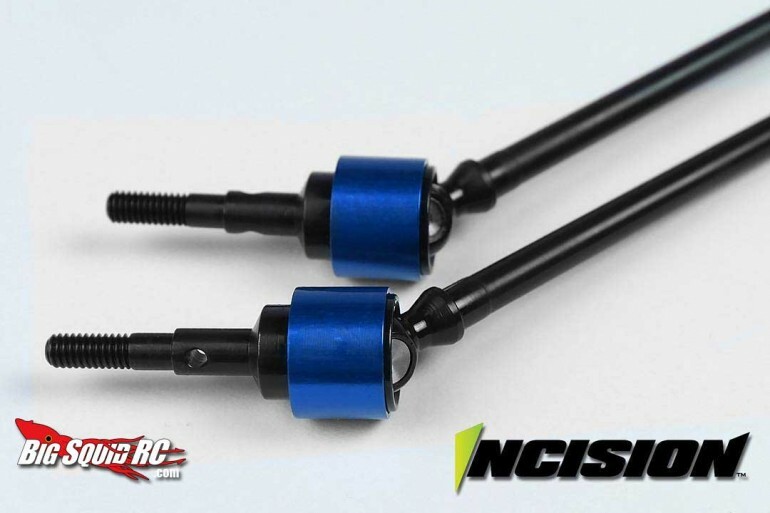 Vanquish Products are at it again with their new Incision line of affordable parts. The Idea? A high quality parts line manufactured in the USA at an affordable price. VP knows their parts come at a premium, thats because they try and bring you a no compromise top tier parts line with an emphasis on creating the nicest parts possible. They also know that the price point that comes along with that does not fit in everyones budget. That is where the Incision line comes in. Still the highest quality materials but maybe dialed back a bit on the fancy machining or laser engraving, and passing those cost cuts on to the customer. They teased the new CVDs on their Facebook page yesterday and hinted at some things in the pipeline. The Incision CVDs have the same specs as the flagship Vanquish VVD axle shafts and will use the same rebuild kits so maintenance is not a worry. These have not hit the market yet but they will in the near future so keep an eye out here when we get our hands on a set. Price: Unknown at this time. To check out everything Vanquish has going on click here.